While I am certainly not the Queen of Vanilla Reloads, I do try to make sure my Bluebird is happy and well fed each month. 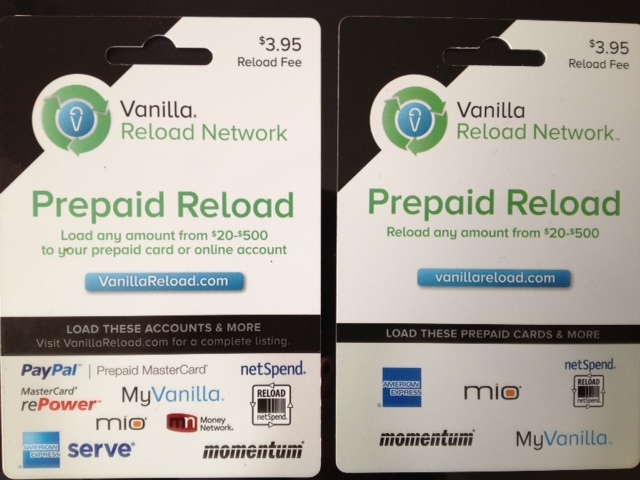 As VR has increased the number of options for reloads, there have also been other changes… an updated website…and a change to the Pin scratch off on the back of the card. The old scratch off area was a solid silver stripe whereas the new one has somewhat of a mottled design to it. What I did not know was that the new scratch off area is VERY sensitive. Tonight as I began scratching off the first card, I accidentally scratched off the last four digits of the PIN on the back of the card. Oh my gosh! What to do? I frantically dug through my receipts and found the one for this particular card because I knew it showed the activation number. 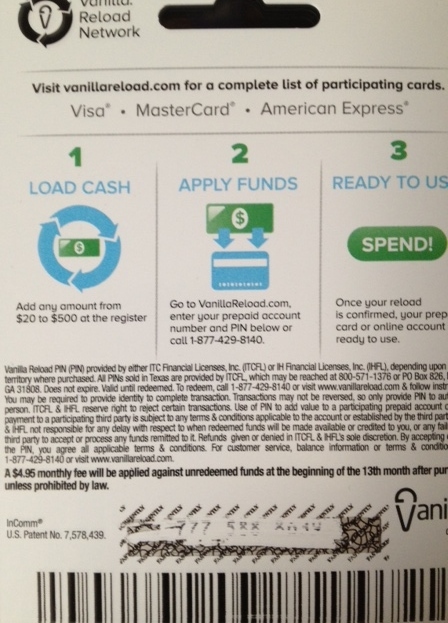 Well, duh….the four digit activation number is NOT the PIN! I logged on to the Vanilla site to attempt multiple guesses at the last four digits. Try as I did, I could not read the last four digits! I tried every combination I could think of trying to match the tops of numbers with the way the numbers look on other cards. Fail. In a state of near panic, I started with option 3. No help there because they wanted the PIN. Then I went to option 4…. Nope. My question was not there. There was still no choice to speak to a ‘live’ person. I hung up and figured I would just have to go back to the store and see if they could help. But with one last ditch hope I hit ‘redial’ on my phone. Now, all of the numbers I had tried pressing were still loaded on my phone and I am not sure how it worked but when the phone finished dialling all 36 numbers, magically someone named Anthony answered the call. How much was on the card? Where had I purchased the card? After a few periods when I was placed on hold, he returned and asked me which card I wanted to load. I answered, “Bluebird.” He said, fine… and then asked for my AMEX (Bluebird) number… and loaded it right then and there. My hero! So, should you ever destroy the PIN on the back of your Vanilla, know that there is an Anthony out there somewhere to help you make it right! I’m just not sure how I managed to reach him! 7 Comments on "Vanilla Lessons"
You have my sympathy! 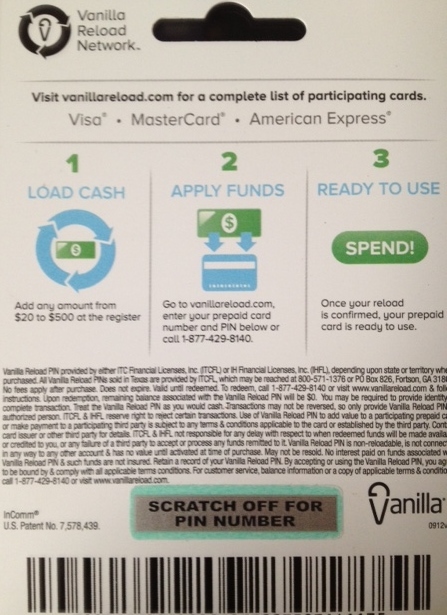 I haven’t done this with a Vanilla Reload, but I did do that with an Amazon.com $100 gift card (bought with my Ink Bold card at Staples, of course). This was my first go around with gift cards, and I rubbed a bit too aggressively with the quarter I was using. I did something similar to what you did. I contacted Amazon and they were very helpful; they managed to trace the PIN # to the shipment of gift cards sent to that Staples and saved the day. I am MUCH more careful now with rubbing off those strips; some of them are easily damaged! Don’t feel bad, I did the same thing! Luckily, I caught myself before too much destruction AND guessed the number correctly when entering it online. Phew! @RMF325 – I’ve actually found that you can just peel the Amazon gift card security strips right off. No scratching necessary! I did the same thing to my first “new” style card. I was able to also correctly guess the last four digits. So of course I found your blog post after doing the same thing. I don’t have a sweet Southern voice, so when I got to Customer Service, they are making me send in pics of the card, the receipt and my license. Ah well, at least it can be fixed. BTW, I had the same issue with the menu that you can’t get through. Choose ‘3’ for the PIN # and then put in all ones (1111111111) and then wait. You will be asked if you want Customer Service. They said 3-5 business days (I sent everything immediately). I’ll let you know what happens. UPDATE: The same night (a Friday), I sent an email with photos of all the documents. I received an automated email advising me it would be 3-5 business days before I received a reply. Well, I got a call today (Monday) from Incomm (the VR people I guess) saying they had my PIN!!! I called and gave them the case # and they gave me the PIN from the card, I loaded up my BB and everything is taken care of. Whew! I am very impressed with their Customer Service – everyone was nice and polite and they sure did take care of my situation quickly. Needless to say I have learned my lesson. Now, off to CVS!!! I am so glad that worked out for you!